In the middle of the second century, the scholar Pausanius published his landmark Description of Greece. Among the many civilizations he documented was the kingdom of Mycenae, which reached its zenith during the late Bronze Age (circa 1650 B.C.). 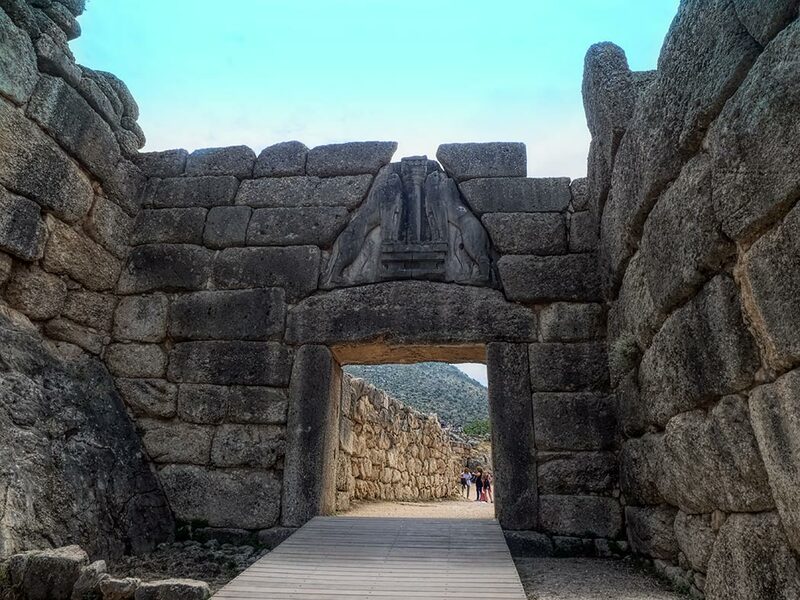 He referred to the “mythical history” of Mycenae, stating, “There still remain, however, parts of the city wall, including the gate, upon which stand lions.” He was referring to what we today know as Lion Gate. Mycenae went into decline after 1650 B.C. and by 1100 B.C. it lay in ruins, for reasons that are still being debated by archeologists. Over the ensuing centuries, memory of the city faded. Even though the acropolis upon which it stood was clearly visible, no one recognized that the ruins were the ancient citadel of Mycenae until 1700, when the government of Venice ordered that all holdings in the Peloponnese be registered. The Venetian engineer, Francesco Vandeyk, used the description of Lion Gate that Pausanius had provided some 1,500 years earlier to positively identify Mycenae. There was no mistaking Pausanius’ description. The citadel stood at the top of a ramp that led from the plains to the crest of the acropolis. Near the top, enormous stone blocks walls narrowed to form a stone gate. Atop the gate’s stone lintel stood a massive triangular stone, featuring two carved lions rearing up on hind legs, facing one another from opposite sides of a column. The lions were a sign of royalty and power, meant to instill fear into the hearts of those who meant the kingdom harm. At some point the heads of the lions disappeared, however the sculpture is otherwise intact. Lion Gate was the largest prehistoric sculpture ever discovered in the Aegean and it is the only surviving monumental piece of Mycenaean sculpture. Author’s note: I was a guest of Collette during my visit to Mycenae, Greece. However, the receipt and acceptance of complimentary items or services will never influence the content, topics, or posts in this blog. I write the truth, the whole truth, and nothing but the truth.